Nothing can prepare you for that moment when you first become a dad. We, like many other couples crammed for the test hoping that within all those baby books trying to prepare you for their arrival that something would stick. The truth is, that once they put that baby in your arms you forget everything. Life becomes unscripted and unwritten and you learn along the way how to become a father in the role of #WorldsToughestJob. Nothing will make you appreciate your father more than this feeling, knowing that once your own dad held you the very same way, unsure of where to go next and what was to come in the future. It made me feel closer to my own dad knowing that he was once just like me. Last year for my son's 8th birthday, my wife and I surprised our son, who had a Night At The Museum birthday party, a trip to NYC to sleepover at the American Museum of Natural History. Now, I am not a big fan of giant cities and driving in the Big Apple is not high on my fun list but I would do anything for my son to see him smile. So I braved sleeping on a cot next to hundreds of other snoring dads with no locker room to change in to sleep under the Giant Blue Whale with my boy. During our time there we were given a schedule of activities we could attend but I saw some opportunities to show him that sometimes life needs to be unscripted. I said to him "Says we can go to this exhibit like like everyone else OR we can go explore on our own. What do you say?" He was apprehensive and a little afraid that we were going to "get caught" but I reassured him and we set off into bowels of the museum. We plunged into the depths of the eerily quiet museum. I have to admit, it was creepy but cool. With no one around you could just imagine these things coming to life at night. We explored the museum looking for things from the Night At The Museum movie and taking photos of our discoveries on our own private scavenger hunt. The look on my son's face while he navigated the map and told me which way to go made him feel like a real life Indiana Jones. The moments like these that are totally unplanned reminded me of my own dad and how we would take us points of interest that he thought would pan out. Once, he planned for us to see the La Brea Tar Pits in California and talked it up the whole time. When we got there, it was closed but the photo we took in front of the locked gates is forever etched in my mind. No one knows more than stay at home dads just how tough it can be to be right on target everyday when it comes to parenting. Often, dads don't get the same attention as moms do when it comes to caring for the kids. Dads deserve more recognition and appreciation for their parenting – it’s tougher than it looks! 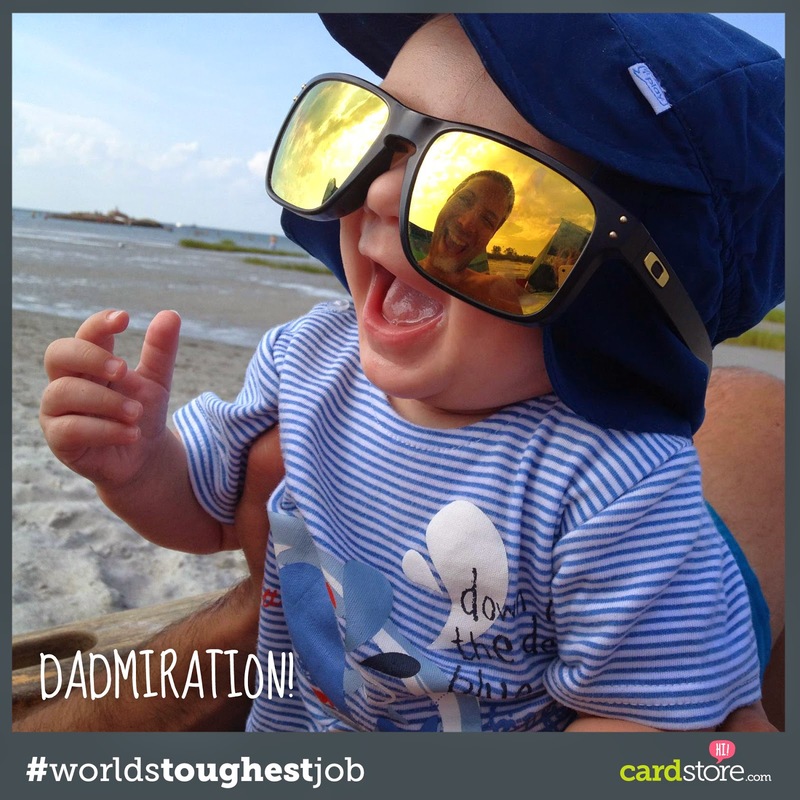 Cardstore and their #WorldsToughestJob campaign looks to celebrate those moments by immortalizing them in a Father's Day card that you can customize for your own dad. Because hey, he's your dad and you want to get him something special from the heart right? I did and so can you. The website is so easy to use and allows you to download your own photos, edit, and personalize the words and fonts the way you want them to look. Right now you can get a special deal for a $2.49 Father’s Day card offer. Use the code is CCG4527 but it is only valid 6/3 – 6/9. Get in on the fun this Father’s Day, and make sure dads get all the love they deserve. 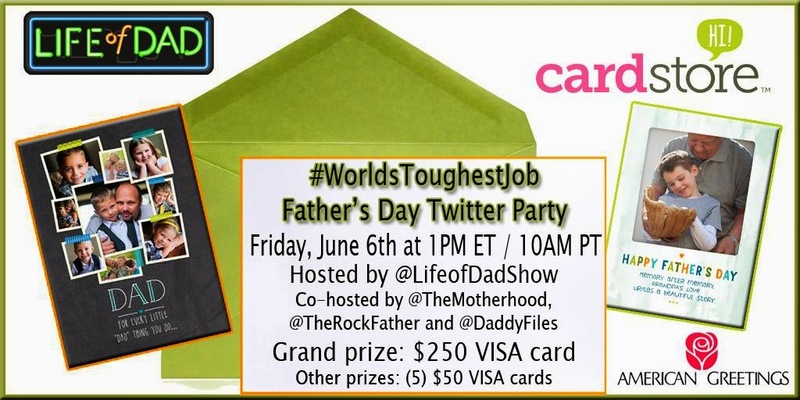 Be sure to tag all your tweets, posts, and pics about Dad with #worldstoughestjob and Cardstore will tally them up in this cool Dadmiration Tracker. Disclosure: I partnered with Cardstore from American Greetings and Life of Dad, LLC for the #WorldsToughestJob Dad Casting Father's Day promotion and was compensated for my involvement.